Our long time member Deano1 continues his series of original album reviews with Loving You. The year was 1957 and Elvis could literally do no wrong with each record release. This was true whether it was a single, an extended play or a LP. The “Loving You” soundtrack album, at least from a commercial aspect, was no different as it went to #1 for 10 weeks on the Billboard LP chart. A closer look at the actual album content suggests a harbinger of things to come for future soundtrack LP’s and even some non-soundtrack albums. Some of those things are good, others not so much. The album starts off very strong with the mean and raucous “Mean Woman Blues”. A song that charted on the R&B charts (position #11) based off its appearance on the “Loving You, volume 1” extended play. Written by Claude Demetrius, who would later contribute “Hard Headed Woman” for “King Creole”, this song is delivered convincingly by Elvis and matches the intensity of some of his greatest rock and roll records. “Teddy Bear” follows and it is delivered in a fun, infectious style by Elvis. It is a very short track; however, that doesn’t take away from the fun of it. Not quite on par with some of the other 50’s singles, but still top-notch. The album continues its strong start with the title song as the third track. While not yet the ballad singer he would become in the early 60’s, he still sings this one very well. Nicely written with a simplistic arrangement and light years better than some of his early attempts at ballad singing such as “I Love You Because”. The album starts to decline in quality from this point forward and while there are some good tracks, most of the remaining nine songs are not of the same quality as the first three. “Got A Lot o’ Livin’ to Do” is the first time where an Elvis rock and roll song sounds forced. Elvis also sounds a bit rushed in his delivery and at times he is almost impossible to understand. Still it is not bad and it is nowhere near as bad later soundtrack “rock and roll songs” (think “Baby, If You’ll Give Me All Your Love” from “Double Trouble”). That said, it is a definite step down at this point in his career. Next up is a strange song that I guess would classify as a ballad. “Lonesome Cowboy” was written by Tepper and Bennett and I while enjoy their songs more than many on this site do, this one just fails to deliver much listening pleasure. Elvis starts by waling the opening and then modulates between singing softly and operatic blasts. The Jordanaires, who normally enhance an Elvis track, sound noisy on this one and this track like the previous one comes across as unpolished and lacking feeling. Not a disaster, but not a highlight by any means. Two quick “rockers” complete side one of the album. “Hot Dog” and “Party” are harbingers of the short fast paced songs that would later fill Elvis’s soundtrack albums (“Slicin’ Sand”, “Catchin On Fast”, etc.). Again I am not saying they are bad, but when compared to Elvis’ other 50’s rockers, these two songs are light years away from those. “Hot Dog” is better than “Party” especially as delivered by Elvis although Elvis again sounds rushed as opposed to truly rocking the song. Neither are overly memorable. On this, Elvis’ first soundtrack album, we are introduced to what the Elvis world affectionately call bonus songs. Songs either recorded for the movie, but not included or songs recorded at recent recording sessions with no actual relationship to the movie. In later years, they were the best thing on an Elvis soundtrack album (“Guitar Man” and “Big Boss Man” from the LP “Clambake”, “Long Lonely Highway” from the LP “Kissin’ Cousins” and “What Now, What Next, Where To” from LP “Double Trouble”), but on this LP they are truly leftovers from recording sessions ranging from quite good to poor. Elvis’ take on Fats Domino’s signature song, “Blueberry Hill” leads off the second side and it is unfortunately amateurish and unmemorable. With great songs such as “Is It So Strange”, “Tell Me Why”, “Playing for Keeps” and “That’s When Your Heartaches Begin” either not yet released or only available as the B-side of singles, one has to wonder why RCA and/or Colonel Parker would use “Blueberry Hill”. Unfortunately “Blueberry Hill” is not the worst bonus song on the album. “True Love” follows and the inclusion of this one is even more puzzling. It is a well written song by Cole Porter and it was originally performed by Bing Crosby and Grace Kelly a year earlier for the movie “High Society”. Elvis’ version features him harmonizing with the Jordanaires, but failing to deliver any real listening pleasure. If Elvis had recorded this in 1962, he would have nailed it (still wouldn’t be a favorite of mine), but his 1957 ballad voice just wasn’t smooth enough to make this one work. If you believe the stories even Elvis himself was not satisfied with the finalized version of the third track on side two. “Don’t Leave Me Now” would later be rerecorded for the movie “Jailhouse Rock”, but here we have the February recording. This track is actually much better than the two before it and it is a welcome change of pace. Elvis pleads his case convincingly to not leave him in this well-written song. Not great, but very good. 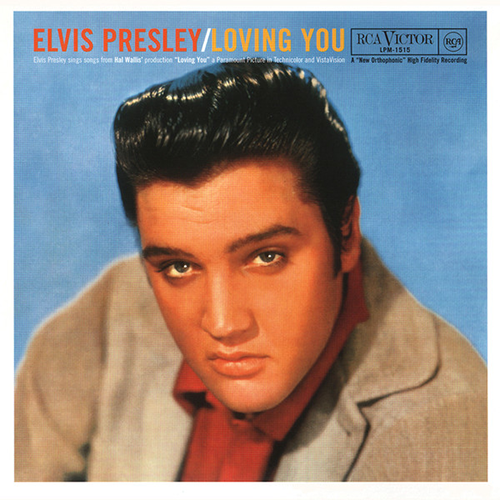 “Have I Told You Lately That I Love You” is the fourth entry on side two and Elvis and the Jordanaires produce an upbeat and fun version of a song that had been recorded by many artists including Gene Autry (original hit version) and a parody by Crosby and Hope. This one could have been a hit for Elvis had RCA decided to release it as single; however, it is best suited as an album track. The album concludes with the song “I Need You So”. Similar to “Don’t Leave Me Now”, Elvis sings and pleads this one like only he can do. On the choruses, Elvis waling which seemed forced and over-the-top on “Lonesome Cowboy” sounds perfect. The best track on side two and a good close to the album. After listening to this album several times over the last few days, I can honestly say I receive more overall enjoyment out of the “Fun In Acapulco” soundtrack album than I do this one. This album is not bad, but it far from a classic and nowhere near one of Elvis’ best overall albums. A solid, but uneven three stars similar in that manner (not content by any means) to the “Elvis Now” album 15 years later. Moments that will take your breath away followed by tracks that leave you scratching your head by their inclusion. Some of the comments here are really difficult to understand. Elvis’ original version of Mean Woman Blues is light years better than Roy Orbison’s truly terrible cover version. Jerry Lee Lewis’ was also infinitely better than Orbison’s but not comparable to Elvis’ version in any way. Speaking of Lewis, I've always thought that Got A Lot of Living To Do was influenced by Lewis' style, particularly from the Million Dollar Quartet session, just months before. Not top notch but I've never had any issue with understanding the words at all! To call Elvis' version of Blueberry Hill 'amateurish' is frankly perverse - it is a great version, incidentally, like Have I Told You Lately That I love You and Here Comes Santa Claus, first recorded by Gene Autrey. Loving You itself is one of my favourite songs from the 50s, but detest the faster versions - the slow version is sung to perfection, so again baffled by the perverse comments that Elvis wasn't a great ballad singer at this point - although simple, it is a classic Elvis hit and much covered by the likes of the Righteous Brothers, Paul McCartney, Billy Fury etc. As with Loving You, the blues inspired balled, I Need You So more than proves he was (ie a great ballad singer in the 50s). Party is much too short, as is Teddy Bear, the latter being fluff, very successful fluff but fluff nonetheless, however, it is a brilliant performance. The remainder songs are not really worthy of comment - especially Hot Dog, which is easily the worst Leiber and Stoller song Elvis recorded up to 1973. The best song recorded or tried out (depending upon view as it was recorded on the soundstage) for 'Loving You never even made it - One Night (of Sin). This is a performance of raw genius. Together with Mean Woman Blues, two of the best things he ever did; of course, not forgetting Loving You itself. Thank you Adams for the nice words. I am by no means a professional reviewer but I love discussing Elvis' music. Deano1, I must say I almost always agree with your opinions about songs and now I'm really glad to see your first two reviews of Elvis' albums. Hope this will continue. I couldn't agree more in the case of Loving you, a quite mediocre LP at best. I remember listening to this LP first time perhaps some thirty years ago and a big disappointment that came after hearing it. The biggest one was Blueberry Hill (when compared to Fats version) but of course in my opinion there are many weaker songs on it. I just expected too much form Elvis doing BH and that's why it was such a big disappointment to me. Loving you, the song, is a good one but since Elvis has yet to have his angelic voice from 1960-63 I prefer the fast version of it. My rating of LP - 3 stars or maybe just 2 and half. I read somewhere once that Elvis once called some of his '50's output rock and roll bubble gum. I do like Mean Women Blues... by Roy Orbison. His weakest LP from the 50's but still much better than the soundtracks of the 60's, even though this was not a full soundtrack album. Stand out tracks are the title song, the classic Mean Woman Blues (how can one not like this? ), Got A Lot of Livin To Do, and I Need You So. Party is a great little rocker but way too short. The rest is just filler, and I really think Teddy Bear is bubble gum rock fluff, but good for its time I guess. Dont know why Elvis chose to do this song in concert in the 70's instead of other 50's classics. He thought his 50's stuff was juvenile and he does Teddy Bear? Anyway, I cant take or leave the LP as it is. I didn't care for this LP in 1957 and my appreciation hasn't increased through the years. The only tunes I like are Teddy Bear/Loving You (single versions). 2 a half stars.